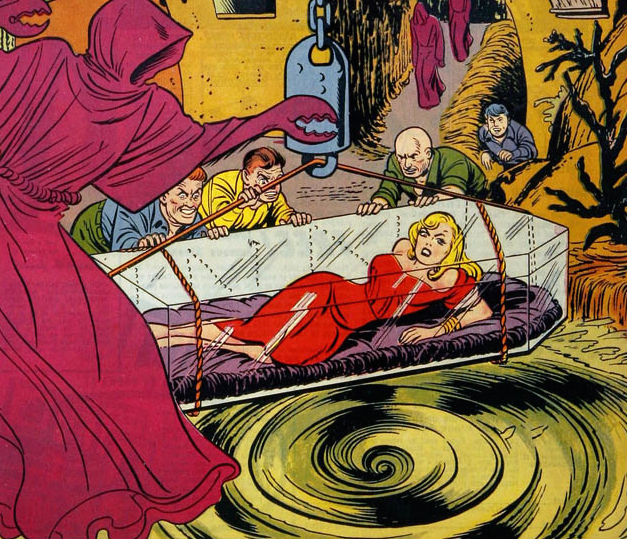 This pre-Code comics image plays neatly with both the “coffin stuffer” and “tube girl” themes so loving explored in the pulp era less than a generation earlier. It is reblogged from this 28 September 2015 post at Infernal Wonders. The now-dead tumblr (“Malignantly Useless,” a fine Thomas Ligotti-derived name!) 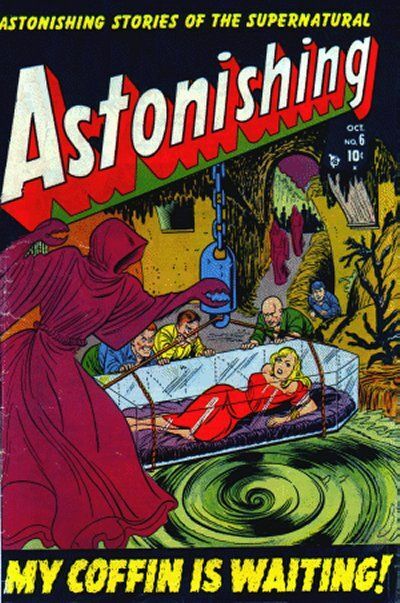 on which the image first appeared attributed the image to Issue #6 of Marvel’s Astonishing series (1951-1957), and a trip to this series’s entry in the Grand Comics Database does indeed turn up the cover. Malignantly Useless attributes the cover to Norman Steinberg. Been reading old Legion of Super-Heroes comics, recently. So for me, that’s Saturn Girl in the glass coffin, with the Time Trapper commanding a hypnotised Lightning Lad and Matter-Eater Lad (and a time-lost Lex Luthor, or perhaps Universo) to lower her into the vortex, with several time-duplicates of the Trapper approaching from the corridor, while Cosmic Boy crouches in a corner deciding how he’ll save the day. I’ll bet Cosmic Boy often does save the day.